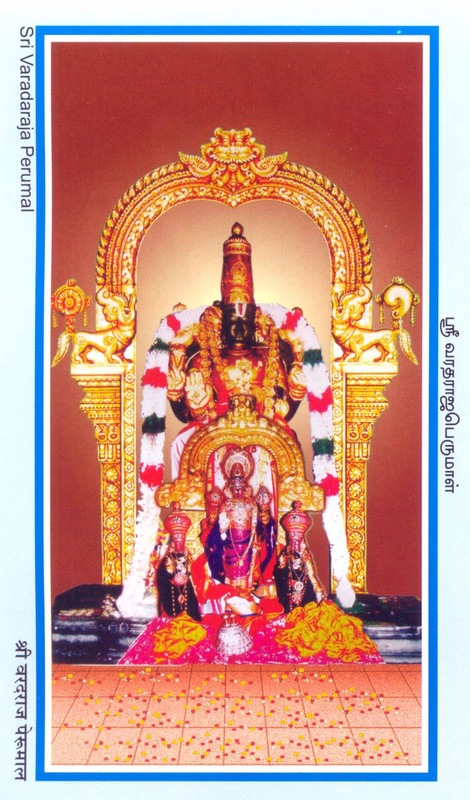 Sri Varadaraja Perumal Temple, Kanchi is one of the 108 Divya Desams of Lord Vishnu. The 12 Alwars had visited this holy abode of Lord Vishnu and sung praising the glories of Athiyuran. The idol of Sri Varadarajar also known as Athiyuran (Athi Maram) made of Fig Tree. The magnificent tower of 180 Ft built in 11th century, was the contribution of King of Vijayanagara. The hundred pillared Mandapam, paintings and carvings reveals the ethnic beauty and the skilled craftsmanship. The Dravidian architectural style of this temple was originated by the Cholas during the regime of Kulothunga Chola I and Vikrama Chola. The temple is located on the top of Athigiri (Hasthigiri), one has to climb 24 steps to reach the sanctum sanctorum of Lord Varadaraja. The huge idol of Lord Varadaraja with Chathurbjua and Abhyahastha is facing west. 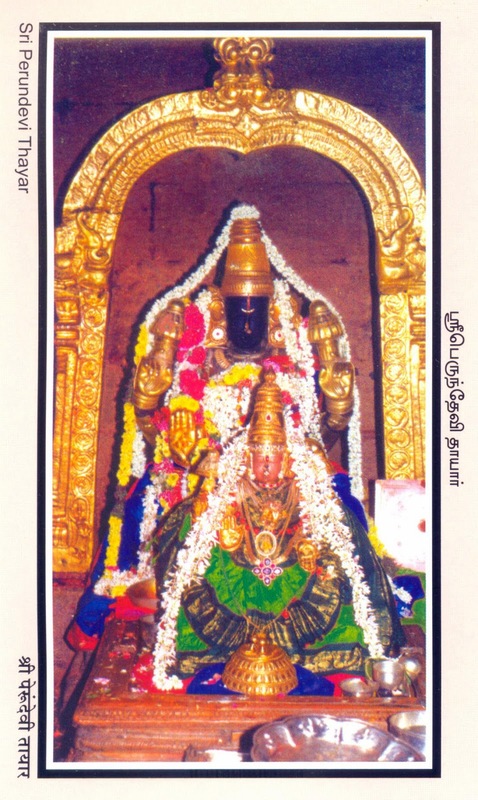 ThiruKachi Athigiri - Varadaraja Perumal temple is referred to as the ‘Perumal Koil’ among Divya Desams. While Srirangam is referred to as ‘ The Koil’ and Tirupathi as the ‘Malai’ among Divya Desams, Kanchipuram Varadaraja Perumal temple is known as the ‘Perumal Koil’. Varadaraja Perumal temple is on a 22 acre temple complex in Chinna (small) Kanchipuram on the Kanchipuram - Chengalpet - Madras road. There are two big Gopurams - the Eastern Gopuram built by Krishnadeva Raaya and the Western temple tower built by the Pallavas. Later, several rulers contributed to the renovation of this temple. Several beautiful sculptures can be seen at this temple. The legend has that, Lord Brahma desired for dharshan of Lord Sriman Narayana with Shangu, Chakra, Gadha, ( Conch, Disc, Mace) / 'Chathurbuja Seva' and underwent severe penance. Lord Narayana pleased at the devotion of Lord Brahma and gave Him dharshan in the form of 'Pushkarani' (Theertham). Lord Brahma was not satisfied, He continued His Tapasya, Lord Narayana appeared in the form of a ‘forest’, which was came to known as 'Naimisharanya'. At this point of time, an unknown voice from the sky instructed Lord Brahma to perform hundred Ashwamedha Yaga to get the Chathurbuja Seva of Lord Sriman Narayana as Sri Varadharaja. Lord Brahma felt depressed at the thought of performing hundred Ashwamedha Yaga and the requirement of time and efforts for it. As per the instruction of Lord Sriman Narayana, performing one Ashwamedha Yaga at the scared land of Kanchi is equvalent to thousand Ashwamedha Yaga, Lord Brahma began performing the Yagam and Sri Varadharajar emerged out of the scared fire. Finally, Lord Brahma had the Chathurbuja Seva of Sri Varadharajar as He was desired. One can find the Azhagiya Singar (Lord Narasimhar) Sannidhi on the way to Varadaraja Perumal Sannidhi. 24 steps from the Eastern side(entrance) leads one to the Prakaram of the Varadaraja Perumal. Once into the Sannidhi, another few steps takes one to the tall standing posture of VaradarajaPerumal, seen facing the West. Belief is that Brahma comes here once a year on the full moon day in the Tamil month of Chitrai (April-May) around mid night, for a darshan of Varadarajan. On this day, it is the practice for the priests to place food inside the sanctum and to wait outside for 24 minutes. At the end of this, the food is said to smell sweeter. During the Muslim invasion, the moolavar deity(Lord Varadarajan) is said to have been damaged. As a damaged deity could not be worshipped, it was immersed in the temple tank. The moolavar that we see today at Kanchipuram was brought from Pazhaya Seevaram, about 20kms from Kanchipuram. In memory of this, the Utsava idol of Lord Varadarajan is taken on a procession once a year, during the Tamil month of Thai (Jan-Feb) to Pazhaya Seevaram. Lord Narasimha is also taken on a procession to Keezh Seevaram during the Sankaranthi period (Kanu). The original moolavar of Lord Varadarajan which was immersed in the temple tank. Athi Varadan is taken out once in 40 years and placed outside for public worship for a period of 10 days. This event took place last in 1979 and the next one is slated for 2019. Every Friday, Goddess Perundevi Thaayar goes out on a procession within the prakaram(Goddess does not leave the temple premises). Lord Varadarajan goes on a street procession every month on Pancha Paravam days. When this falls on a Friday, the Lord goes out on a street procession with the Goddess waiting at the Main Gopuram for Lord Varadarajan to return. From the main gopuram, Lord Varadarajan and Perundevi Thaayar come back together and both proceed to the garden behind Sudhasaran sannidhi for the devotees to offer their worship. The street procession of Lord Varadarajan on Garuda mount in the tamil month of Vaikaasi is one of the most popular festivals here at Kanchipuram. During winter, Lord Varadarajan wears a sweater to protect him from cold. Sacred bath for the Lord during this period take place with hot water/milk. On Navarathri(all days) and Theppotsavam festival days, Lord and Goddess are seen together within the temple prakaram. Two disciples of Gauthama Rishi used to fill water every day for their Guru. One day, to their shock, they found a lizard jumping out when they placed the tumbler in front of their Guru. An angry Rishi cursed the two for their carelessness and they instantly turned into Lizards. The 2 disciples stayed here at Kanchipuram as lizards until Indra came, as Elephant Gajendra, to worship Varadarajan Perumal and relieved them from their curse. In memory of this, there is a golden lizard and a silver lizard outside the Varadarajan Sannidhi. Belief is that one will be relieved of all diseases if one prays to Lord Varadarajan and touches the Lizard on the way out. A debate took place in the court of the Devas as to which was more worthy – ‘Family life’ or “Life of a Sanyasi’. When they could not come to a conclusive answer, the Devas looked to their preceptor, Brihaspathi for a final decision. Brihaspathi pronounced that Sanyasin was better. Angered at this decision of not recognizing the difficulty of family life, Indra cursed Brihaspathi to become a poor Brahmin with children. Leading this life, Brihaspathi one day chased away a hungry dog which had come inside his house and was cursed for not providing refuge to a hungry animal. And he was turned into a dog. The Devas, by now, were feeling the absence of their preceptor. When Indra approached Brahma to help get Brihaspathi back amongst them, he was asked to accompany Brahma to ThiruKachi where Brihaspathi was already undertaking a penance before Varadaraja Perumal. Answering their prayers, Lord Varadarajan is said to have given Brihaspathi his original status and form. As Lord Vishnu accepted requests of everyone and gave what they wanted, he came to be called ‘Varadar’(one who gives). Aalavanthaan met Ramanuja for the first time here in Kanchipuram. The story goes that Ramanuja once lost his way in the Vindhya forest. Lord Varadarajan is said to have appeared as a hunter and carried Ramanuja all the way to Kanchipuram. A tired Varadarajan (the hunter) asked Ramanuja for water. When Ramanuja brought water from the street well, he is said to have seen Lord Varadarajan, along with the Goddess, disappear right in front of him into the temple sannidhi. To this day, sacred water for Lord Varadarajan is brought from this street well. ThiruKachi Nambi used to ‘fan’ Lord Varadarajan to prevent the Lord from sweating under the heat. It is believed that he also used to have daily interactions with the Lord. Ramanuja, who was performing the daily rituals for Kanchi Varadaraja Perumal, had to be moved to Srirangam to succeed Aalavanthan. ThiruKachi Nambi is said to have got the permission from Varadarajan to allow Ramanuja to move to Srirangam. Hence, Varadaraja Perumal is credited with the handing over of Ramanuja to Srirangam. 06:00 am to 11:00 am ; 04:00 pm to 08:00 pm. Temple town Kanchipuram is about 75kms from Madras. One can take the Madras- Bangalore highway or Madras-Chengalpet route to reach Kanchipuram. There are 15 Divya Desams (Vaishnavite temples) in Kanchipuram alone. 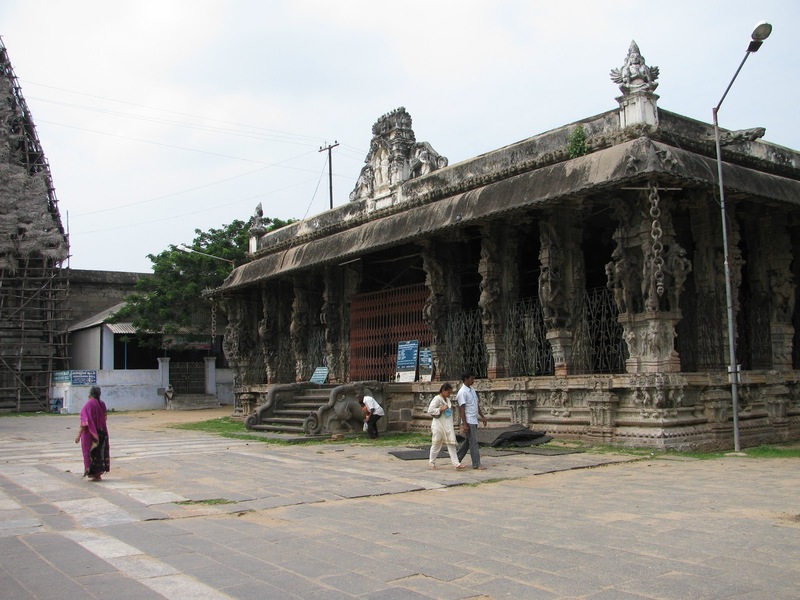 Also, in Kanchipuram, are two famous Saivite Temples- Ekaambareswar and Kamakshi Amman Temples. There is a new railway station in Kanchipuram- the line has been recently converted to broad gauge- with trains running between Chengalpet and Arakkonam. There are also daily local trains between Madras and Kanchipuram via Chengalpet. Kanchipuram is well connected by road with bus facilities to all parts of Tamil Nadu. Thanks for sharing such useful and Good divine information coming daily on website. I would like to request that whatever Ananda Guruji is conveying in Suvarna Channel if it is published in this web site (as earlier whatever Guruji was Conveying was published) it would be of Great help to all of us. Once Again Thanks for sharing such useful and Good Information. Will sure work on it, once we finish with 108 divya desam Temples.